Perhaps, like me, you’re used to thinking about bringing customers onboard as a funnel. It’s a very natural metaphor for thinking about customer acquisition. For example, you market to 10,000 people, 500 people visit your website, 50 of them put something in the basket and 10 of them buy. If you draw it out it looks like a funnel. And the next time you market you start fresh with a new 10,000. But the real world isn’t like that. Delivering a good service to your customers helps the next customers come in. Hence the flywheel model. A flywheel is typically a big heavy wheel that stores and releases energy from an engine or vehicle. 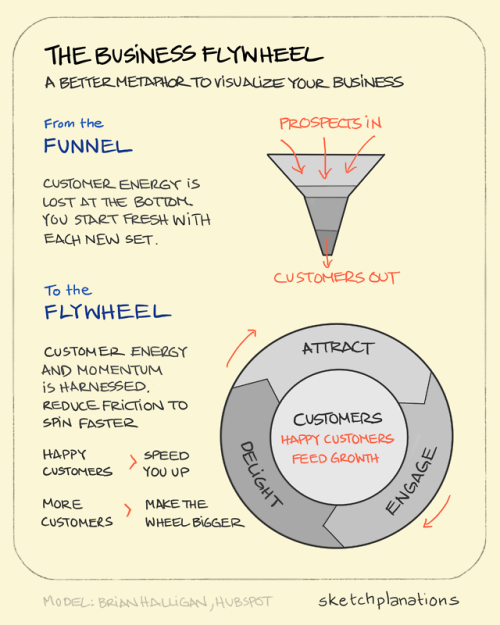 The flywheel metaphor is about happy customers driving your growth. And when you think about your business this way it can cause you to make different decisions. Having more customers is like a bigger, heavier flywheel containing more energy. Happy customers speed you up, unhappy customers slow you down. Making it easier for customers to try your product reduces friction, as does making it easier for for customers to talk about and share your product. Get your flywheel big, heavy and spinning like crazy and your business is doing well. The flywheel model is from Brian Halligan at Hubspot. I’ve thought about customer funnels for literally years and I wish I’d known about the flywheel long ago. Check out Hubspot’s flywheel intro for more.